By Apples, Thank You for the Snack, Lady! Remember my recent tales of the possum in the garage? A few days ago, I set a bag of overripe apples on the back deck with the intention of taking them out to the back fence row to leave for the deer. I noticed apples had been taken out of the bag and nibbled on. In fact, the bag must’ve been tipped over because I saw my dog carrying an apple around. Since they were near the bird feeders, I thought the birds were eating them. Last night, a movement on the deck caught my attention. 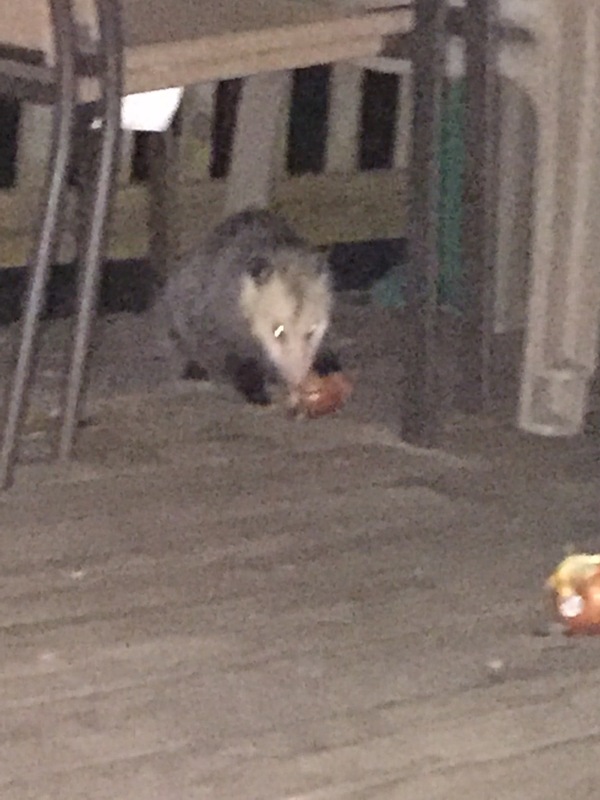 When I opened the door, I saw our friend, the possum, eating an apple and looking right at me!! I slammed the door and it ran under the chairs. Whew! That was close! Now, you would think it would run for its life, but nooooooooo! It stuck around and started chomping on an apple closer to the chair! This time I ran for a camera! The pictures are quite awful. I’m quite surprised how unafraid it was. Heck, after our 3 a.m. meet up in the garage, maybe it thinks I’m pretty darn cool. I mean, I did shut off that stinking radio. The back porch is wayyy better! Hey, I can’t help it. I’m popular! Ha ha ha. I bet you’re right! There pretty docile animals, there only threat is possible rabies. I used to feed one along with a couple skunks years ago. The skunks would eat the cat food right beside the cats. You could even pet them! Oh my!! I am laughing my tail off!!!! Skunks??? You are a brave soul. My only run in with a skunk wasn’t as fun. Totally got sprayed. Pee you!!!! Last fall Vinny and I were sprayed in the face by a very young one. It took months to get the smell off Vinny! PS: it tastes worse than it smells! That’s living in the woods of Maine! Now that possum is NEVER going to leave :D New best friends. Ha ha ha. I’m afraid you’re right… Maybe I’ll put the weather radio under the chairs!! Right next to the apples! Ha. Man, that made me laugh out loud!! The pictures are not awful, they’re hysterical ! The eyes look like they’re cartooned, especially the second pic which got me to laughing more.. The possum looks crazed and cross eyed looming over the delectable delight.. But I’d probably discourage anymore garage or porch feedings, accidental or on purpose.. Just because it doesn’t have rabies now doesn’t mean it can’t at some future time.. Behavior in infected animals can range from friendly to ferocious.. My dad had a pair of foxes he fed daily, about 100 yards away from the house, outside the fence.. He had them conditioned to know when it was feeding time and the boundary was the fence (after he shooed one several times away that was inside the fence).. He wanted that understood barrier just in case the foxes turned, any behavioral changes would be noticed with a good buffer of distance to react in, if things weren’t right.. It wasn’t believed that opossums could naturally contract rabies due to thier low body temp.. But that has been debunked with cases of rabies showing up in opossums..
Holy moly. Good to know. Yikes. Yeah, pretty sure I’m not about to get too chummy with a wild animal, no matter what it is. They’re instincts are to be wild, not friendly. Next time I’ll take the apples awayyyy from the house sooner. Ha. Hope it moves on BEFORE I plant my garden! Ha. We already have like a gagillion wild rabbits! There’ll be nothing left! Rabies is very uncommon to come across but I wouldn’t want to be that odd statistic..
I’d be more worried about distemper in wild animals.. Either one is bad.. I hope you can reap some yield from your garden.. Hungry rabbits and deer are looking forward to it too.. they’re probably waiting with knives and forks ! Oh my gosh! That image made me burst out laughing! Every animal within 50 miles probably caught wind of me by now… Ha. You are now on the map ! I can’t believe it, Jessica! This is hilarious.😂 What a cheeky possum and I reckon soon his friends and family will be over for a feast! Are they dangerous? Would they bite? I have no idea. Though this possum has made a great story, and has caused some serious laughter around here, I think it is a bit close for comfort. That possum was so close to the house and without fear of humans! Be safe!! holy……….!!!! that thing is creepy looking! he looks pretty big too! arent they saposta fall over and ‘play possum’? but good pics! hahaa you and your trusty camera i love it! you really do take some of the best pictures! you inspire me!